The Atkins diet is now one of the most famous and popular diets around. It works through burning, rather than storing fat, by utilizing a low carbohydrate diet. The benefit here is that you can still eat a lot of the foods you love, so long as they fulfil a few basic rules. The site offers advice on how to maintain the diet, as well as a few essential tools for tracking your progress. 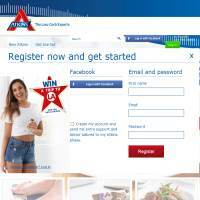 Ultimately, they are offering information on the diet and a variety of products which can help you to succeed through using the Atkins system. Atkins.com provides information on the diet, including any new research and recipes which are out. They update the site pretty regularly with new features and articles, so there’s always a reason to log on. A ‘Get Started’ area is provided for people who are new to the Atkins Diet. Here, you can input your age, height and weight, set goals and retrieve advice about the sorts of diet steps you should take in your phase. The site also offers a range of recipes, which you can search for based on the kind of meal (breakfast, lunch or dinner), plus key ingredients. This is a great way of organizing the recipes because it means you can simply search for whatever you have in the fridge, and the time of day you wish to eat. The diet works on “phases” (which the website explains), so recommended recipes also take your phase into account. Recipes look really tasty, with photos and decent descriptions of how to cook them. They also include the net carbs, protein and fat. You can print or share recipes online, making this a really useful resource. There aren’t quite as many recipes as we’d like to see, but you can also find more on the forums or on other websites. Still, additional recipes here would be useful. Atkins.com attempts to promote a range of special products to accompany its diet. These are primarily bars and drinks, but you can also find low carb cereals and crackers if you’re having a carb craving. A selection of books is also available. You cannot purchase these items through the website, but they do offer a searchable list of locations to buy Atkins products. To further develop, providing online purchase options would be really useful, so you don’t need to go on the hunt around your town. A blog and forum are provided if you wish to speak to other members. This is a good chance to get some insider tips and recipes, as well as support. Everything considered, Atkins.com does a really good job at providing free online advice, information and support to its dieters. It doesn’t hard push its own products either, rather they are available if you want them. If you are interested in trying the Atkins diet, we really recommend visiting this website.